Read this great testimonial/5 star Amazon review written just last week. If you don’t own the book yet, click the book cover to the left to order it. 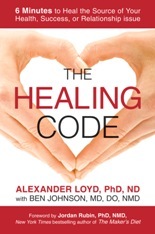 Once you have it, register it at The Healing Code Book site for lots of great bonuses. “This book was recommended to me and my husband by a friend. We purchased it as a Kindle book. It is well designed, formatted and edited in that edition. It has been known for many decades now in both mainstream and alternative medicine that stress is a major contributor–and sometimes a cause–of essentially every known disease. The stress response is also known as the fight-or-flight response, anxiety, adrenaline, or just plain, old fear. In my experience using the healing code (HC), it works fantastically for shutting off a fight-or-flight switch that is stuck in the “on” position. In my own case, I had been experiencing intense situational stress and anxiety from almost two years of caretaking of my husband. He received a hip injury in a car accident over 11 years ago and has been in unremitting pain ever since that surgery, physical therapy, and countless other healing interventions have not helped. And his situation seriously worsened for no discernible reason two years ago, causing him great despondency since no health-care provider mainstream or alternative could help him. Within the first 24 hours of my using the HC as taught in this book, my fight-or-flight stress switch was turned “off,” and my mind was at peace. It was like a magic wand for me personally. As if I’d received a constant dose of some kind of natural tranquilizer that has zero side effects because my own body manufactures it. Over the years I have done many things for stress, for example, meditation, yoga, deep breathing, soothing music, laughter therapy, aerobic exercise, excellent diet and nutraceuticals–you name it. Nothing, and I mean *nothing*, has ever worked as deeply and as quickly as the HC to remove deep-seated stress and anxiety. In addition to making me more mentally and emotionally flexible in daily life, using the HC has completely eliminated my occasional bouts of stress/anxiety-induced insomnia. As for my husband, he also has experienced noticeable improvement in the stress and anxiety produced by his constant pain. Though he states that the pain itself has not yet decreased noticeably, it is a well known fact in the field of pain management (and in the field of natural childbirth) that one’s attitude toward pain strongly affects one’s ability to tolerate it. In addition, when anxiety levels rise, the stress chemicals themselves can physically increase pain by tightening muscles in every part of the body. Sometimes it is hard to see everything a healing technique does for ourselves and it helps to have an outside observer. As for me, my husband says that the lessening of my anxiety is obvious, and it makes him feel less anxious. It also has made our relationship much more natural and relaxed and not constantly focused on almost nothing but his pain. My adult children have also commented on how much calmer I am now. Here is what I have noticed viewing my husband on the outside: In spite of him saying his pain is still there, his whole demeanor has drastically changed. His expression is calm and peaceful. His posture, instead of being hunched over, is straight and firm. His general health is excellent, and even on nights when he doesn’t sleep well because of the pain, he can still work out at the pool at our gym for an hour to an hour and a half. He cannot sit because of his hip injury and can only lie on his right side, which in itself causes pressure pain. To relieve the pressure pain during his waking hours, about 50% of the time he has to stand or walk around. That type of frequent motion requires excellent stamina, which has improved for him since using the HC. Best of all, he has regained hope rather than living in quiet despair–and hope is everything when one suffers from a chronic pain condition. This article is very encouraging as I am in a similar situation and have been doing HC’s for over a year. This has also enabled me to stay calm which I fully appreciate. Wonderful Jan! Here’s to staying CALM! I bought this book and have been using it almost daily for family and friends. Great! Keep doing the Healing Code and see what happens. where do I find truth focus statements? Sample Truth Focus Statements are at The Healing Code Book site. Register your book and find all kinds of bonuses, including sample Truth Focus Statements.